Can stress negatively affect the health of the joints? Check how the course of a stress response in patients who are healthy and who are sick looks like, and also what side effects it produces in the immune system. See how stress affects the progress of rheumatic diseases and why people suffering from joint problems should avoid stressful situations. Physiological - it is the so-called state of emergency, which aims to prepare the body to cope with danger (Cannon, 1932). This type of stress leads to a more extensive heart rate, increases blood pressure and raises blood sugar levels. Physiological stress arises in the case of factors that may adversely affect our body (heat, cooling, injury). Mental - mental stress causes emotional tension. It arises from the actions of external or internal stimulus. Prolonged mental stress exhausts the body and can cause the occurrence of psychosomatic diseases. hair and complexion - excessive stress can lead to hair loss. In rare cases, it may attack the alopecia areata. Stress can be a cause of pimples and rashes on the skin. It intensifies the symptoms of rosacea. chronic headache - as a result of adrenaline, the muscles often contract and tighten. As a result of these frequent changes, a troublesome headache arises. Initially, pain occurs only at the temples, and then spreads all over the head. Headaches may also be accompanied by photophobia and hypersensitivity to noise. A chronic headache can last for weeks. As a last resort, it can also turn into a migraine. circulatory system - in stressful situations, large amounts of adrenaline and cortisol hormones are secreted, which leads to an increase in the voltage of nerve fibers. the immune system - stress decreases the immunity of our body and can contribute to the emergence of numerous autoimmune disease. Eating highly processed nutrients, unhealthy lifestyle, stress, and abuse of pharmaceutical preparations have high impact on the weakening of the body. The list of autoimmune diseases is constantly growing. One of the autoimmune disease is rheumatoid arthritis (RA). A weakened immune system changes its function. The body mistakenly recognizes the body's own cells as harmful cells and treats them as hostile antigens, whom it begins to attack and destroy. muscles and joints - constant tension in muscles and joints can lead to pain symptoms. Stress also reduces the body's ability to absorb vitamins and minerals from the intestines. If our body is exposed to the occurrence of stress, we should provide it with adequate intake of magnesium, which is responsible for the proper functioning of the heart muscle. We should also enrich our diet with antioxidant vitamins C and E.
Permanent stress can cause very negative effects on our body. Adrenaline is a source of instantaneous stimulating of the body and has an analgesic effect. However, in the long term, it over-stimulates the body, heart, muscles, digestive and immune system. Ligaments and tendons link muscles and joints with each other. Persistent long-term muscle tension causes stiffening of the fascia and tendons. Overloading the joints caused by excessive muscle tension can cause severe pain. Persistent stressful situations expose our joints to constant tension, and thus also the weakening of their condition. Many people do not even notice that they are suffering excessive stress. Shrunken shoulders, tense facial muscles, clenched teeth, it's just an example of stress symptoms. Emotional overload also has a negative effect on the skeletal structure. Excessive muscle tension of the neck and shoulders can cause an asymmetric position of the head relative to the neck. It is worth noting that few people realize that muscles and fascia that have been tense for a long time cause the rotation of the various parts of the body (left or right), and this may be the cause of pain or tightness noticeable in the spine, knees, hips and shoulders. Prolonged flexing forces the person to 'search' such a position of the body, which will not cause unpleasant symptoms. Bad habits, attitudes are acquired then, and consequently bad posture can lead to degenerative changes of for example, the spine. This pain can very often be caused by involuntary muscle tension. Stress can also cause very dangerous autoimmune diseases to our body. These diseases arise due to limited immunity of our body. Reduced immunity can be caused by long-lasting stress in our everyday lives. In people with rheumatoid arthritis (RA), the impact of stress on the further development of the disease can be huge. Patients with RA are stuck in a vicious circle of stress, which on the one hand, can cause symptoms of the disease and cause them to worsen, and on the other hand, the disease itself is a source of stress. RA is a characteristic disease which gradually exposes a person to chronic stress. This does not cause the patient to get used to the pain and limitations of progression of the disease, on the contrary, chronic disease is a source of increasing stress, which is produced by the patient's dependence on others and progressive loss of independence, as well as long-term use all kinds of means. In patients suffering from rheumatoid arthritis and other degenerative diseases, emotional disorders are often diagnosed. Depression and neurosis are the most common nervous system disorders. Stress caused by a chronic rheumatoid disease can also manifest itself in the form of anxiety, anxiety-depressive syndromes or befuddlement. PSYCHOLOGICAL STRESS IN PEOPLE SUFFERING FROM RHEUMATISM. Mobilizing (Eustress) - short-term stress, which can have a positive effect. Demobilizing (distress) - the most common chronic stress with a negative effect. Demobilizing stress can also be caused by a short-term situation. Distress in extreme situations may also have crippling effects. Understanding the causes and stress dependents requires a deeper understanding of stress physiology. A stress response starts at the level of the cerebral cortex. The stress signal is directed from the cerebral cortex and the limbic system occurs at this time to emotionalization of stress. The body assesses the type of stress - whether it has a positive impact on the recipient (eustress) or negative impact (distress). A natural reaction to the emergence of stress signals is releasing the cortisol hormone and neurotransmitters in the nervous system. The above-described process of a stress response occurs differently in healthy subjects and in patients with RA. Due to the impairment of the hypothalamic - pituitary - adrenal axis, the level of cortisol released is decreased. The patient with RA experiences pain far more strongly because of the high sensitivity of pain transmitting paths. A study published in 2010 in the book of J. Bugajska 'Psychological stress in rheumatoid arthritis patients: a comparative Polish-German Study. Summary of the current conceptualization of the role of stress in rheumatoid arthritis.' identified a number of interesting aspects concerning psychological stress in patients with RA. The studies described which factors are the greatest source of psychological stress in patients with RA. The results confirmed that the quality of life with regard to both physical and mental conditions in patients with RA is definitely reduced. The feeling of social isolation caused stress in 93% of those surveyed in Poland and 62% of those surveyed in Germany. 50% of patients with RA felt stress connected with lack of independence and a sense of being a burden to their loved ones. Factors that reduced the stress levels of respondents are inter alia higher education and a good job. The survey results indicate the need to take into account stress resulting from a reduced quality of life and mental health of patients in the treatment of RA. Appropriate psychotherapy for patients who are at an advanced stage of a rheumatic disease is very important. Unfortunately, one cannot become resistant to pain. The patient, however, may learn to live in such a way to improve his everyday comfort. Awareness that at the time of severe pain, the patient may appease it by taking appropriate painkillers causes stress level to decrease only temporarily. Therefore, it is crucial to properly select pharmacological agents and, above all, select physical activity. Physical activity is an integral element in the life of every man and very important especially in the case of patients with rheumatoid arthritis and other degenerative joint diseases. 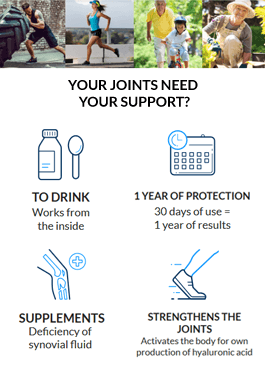 People who would like to reduce the level of stress associated with long-lasting joint pain should introduce an effective dietary supplement to their diet. The Hyalutidin HC Aktiv preparation has high efficiency in regeneration of joints, its main task is to fill in the gaps of synovial fluid in the body. The use of the Hyalutidin preparation not only significantly alleviates pain, but primarily increases joint mobility, which has a direct impact on improving the quality of life. The appropriate level of synovial fluid reduces pain and inflammation. If you no longer want to live in stress associated with progressive symptoms of a rheumatoid disease, reach for an effective dietary supplement for joints.